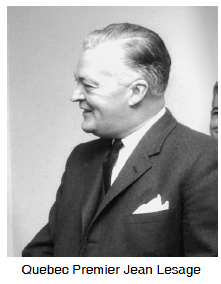 When the Liberal government of Jean Lesage won the Quebec election of 1960, an era of major reform began in the province. The electoral corruption and petty patronage: in politics, the power to give jobs or favours, especially contracts to friends and supporters.patronage that marked the Duplessis years were stopped. One of Lesage's first priorities was to examine the educational system and establish a Ministry of Education to oversee improvements in teacher training and educational facilities and organization. Also, under the advice of his resource minister, René Lévesque, he nationalized the province's private electrical power companies and made them part of Hydro-Quebec. The labour code was revised and government employees were given the right to strike. And a provincial hospital insurance plan was introduced. Lesage exercised a stronger voice in Ottawa, too, creating a department of Federal-Provincial affairs and making himself its first minister. Lesage lost to the Union Nationale in 1966, but the path of reform which his government began continued.